Are you a juice maker? Need an item in a bigger size? 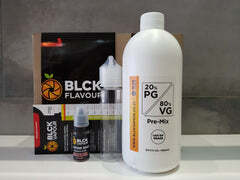 BLCK Vapour now offers concentrates in bulk sizes (473ml or greater) in stock. If an item is not in stock, join our pre order list and get up to date ETA's so you can plan your mixing accordingly. If an item is not in stock, we can source it and get it for you. Contact us for all you bulk concentrate requirements.